A book that I can’t get enough of at the moment is Billy Monk by Billy Monk. 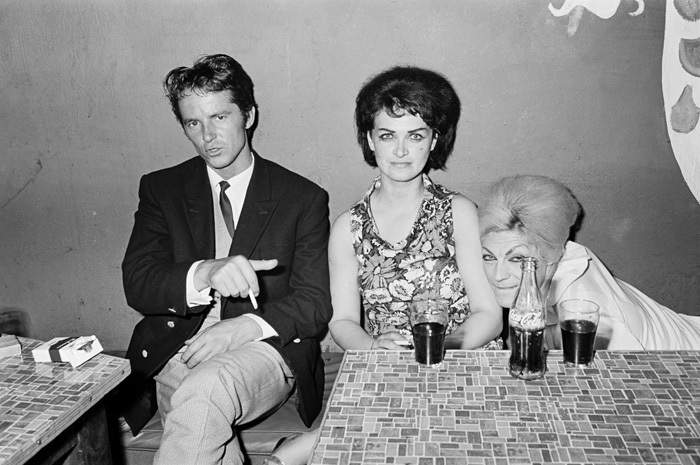 It’s a simple book - a collection of nightclub photographs taken in Cape Town in the late 1960s, mostly from a seedy club called The Catacombs. The Catacombs was a place where the apartheid era Immorality Act didn’t apply, where illegal activities such as prostitution, cross-dressing, mixed race coupling and homosexuality were permitted, where a Filipino sailor and a white woman could happily drink, smoke and kiss in public. Billy Monk is a collection of pictures of this kind of activity, pictures where the narrative leaps out of the page. We see the people Billy Monk photographed and they take us into domestic dilemmas and suburban secrets, into lives and habits and peccadilloes that remain secret outside the confines of The Catacombs Club and Billy Monk’s pictures. These stories are given an edge by the racial politics of South Africa, by the politics of The Catacombs, a place where apartheid still applies in some forms at least (we see 'coloured' people there, but no 'blacks'). The stories are given a further edge by our own ignorance of exactly what is going on, exactly how the rules apply, exactly what goes on in the club, on the street, in the homes or on the ships of the people that we see. We know something is happening but we don't know exactly what; a situation that leaves us free to project our own prejudices or fantasies of the characters that Billy Monk has chosen to photograph. And they are characters. In the picture I have chosen there are three characters. They are sitting at two tables, both made from plywood and covered in a kind of mosaic plastic. The picture's in black and white but if it were in colour, the plastic would be a chemical mix of reds, oranges and browns; cheap and nasty colours that can be easily wiped clean of cigarette ash and the brandy and coke that everybody seemed to drink at The Catacombs. In the middle of the picture a woman stares straight at the camera. Her blue eyes are bright, she's performing for the camera, being elegant and refined, not smiling but doing her best to have an air of contentment about her. However, there is also a sadness in her eyes, a depth that takes one to a life of stoic suffering. She has a Latin look about her, but also perhaps a touch of Englishness, a dark northern beauty transported to the delights of white Cape Town life. And if you were white, it was a delight - unless you look too hard or think too much and then the delights wither and die and the ugly truth is revealed. To her left is a man, a very English looking man. He's smartly dressed in a gold-buttoned blazer and pinstriped trousers and waistcoat. Does he always dress like this or has he been to a wedding? He’s not too happy about the camera being there but still he looks straight into the lens, the dead centre flash bouncing off his pupils. He looks hard, a touch of the street about him. Who is he and what is his relationship to the woman in the middle? He's sitting between the two tables so perhaps he's just chatting them up. The woman in the middle certainly seems to distance herself from him, and he doesn't seem entirely at ease in her company. Then comes the mystery of the picture. The woman on the right. Or is it a man? Let’s call him or her a woman – that's who she is in The Catacombs and probably outside as well. She has a blonde beehive, the roots showing black, her eyes are heavily made up with mascara and eyeliner that matches the woman in the middle. She's leaning down, reaching under the table, so her face is obscured by a coke bottle, a bottle scratched and scraped from a million returns. What she's reaching for we don't know. It seems like she is stretched out, so it might be that she was lying down and is now getting up, or perhaps she's dropped her cigarettes or a lighter. It could be that her hand is on the leg of the woman in the middle, that she is caressing her thigh as Monk takes the picture. It could be that she works at the club. She seems to be sharing a drink with the woman in the middle, the same woman who has got a Rothmans from the man on the left. Cigarrettes and alcohol bringing people together. The first time I saw the picture, I thought the woman on the right was smiling for the camera, her eyes laughing, but now I'm not so sure. She seems to be biting her lips, her eyes have a sadness about them, a wistful remembrance of what might-have-been of what-might-yet-be. Or perhaps she's just tired and drunk. These people all perform for the camera in their different ways but are visually disconnected from each other. But despite this disconnect we want to, or I want to, put them together, give them homes and relationships and families that tie them together in some way. But if I do that, the visual disconnect translates to those homes and families and relationships I have invented. The story becomes sad, little domestic tragedies that can only find solace in the brandy and coke and sordid couplings of The Catacombs Club. Who are these people? Where do they live, who do they live with, who do they want to live with? What has happened to them, what are the stories of their lives? We can make up a story, be a South African John Cheever or Richard Yates for a few minutes and wallow in dysfunction but really we don’t know, we will never know. But with this picture, with all his pictures, Billy Monk posed the question. He gives us the raw ingredients that we can use to make stories for ourselves, stories that reveal our ignorance of domesticity, relationships, politics, culture, sexuality and race and how they apply in a particular environment in a country and time that are so very different to our own. He tells us what we do not know. Colin Pantall is a photographer and writer based in Bath, England who also runs a blog. He contributed to our f100 series.